We finished just as our two hours was up, and this is an inked version of what we came up with. The variation in level is perhaps partly the result of different amounts of subsidence across the trench. Gravestones 2 and 3, those with no surviving inscription, do not seem to have been set into the ground in the way Stones 1 and 2 do. Rather, they give the impression of having been placed onto the ground, presumably over graves that lie beneath. We’ve been away from the graveyard for a while now, holidays have ended, school has started. But today we went back to get to grips with some unfinished business. 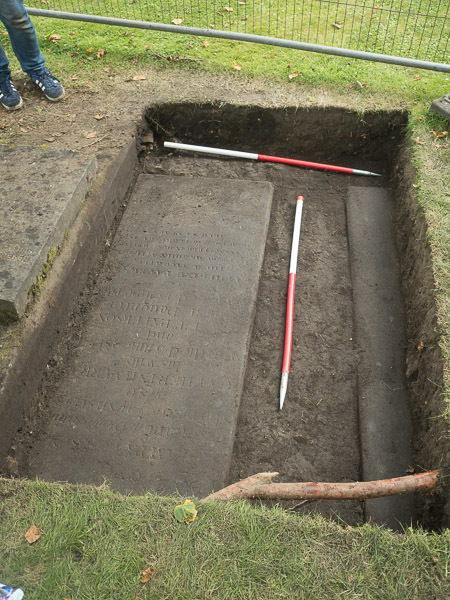 We had cleared and cleaned one of the two gravestones in our trench, but the south stone was still mostly covered by grass and soil. Today Erin, Finlay and Mhairi came along to put that right. Mark and new YAC leader Dougie (also Erin’s dad/bucket slave) quickly deturfed and the young archaeologists got stuck in. Progress was much faster than in the north side of the trench. This was partly down to the growing experience of the team, but we also noticed far fewer inclusions of stone and other rubbish. We found only a little pottery along with a few roof tile fragments, hearth deposits and metal. This led us to conclude that we had emerged through the edge of the material used for the great graveyard levelling works of 1930. Troweling down through the graveyard soil onto the top of the gravestone thus turned out to be a much quicker job than we had anticipated. We soon found ourselves working to clean the stone surface itself, hoping that we would find inscriptions as interesting as those on the north stone. As you can see, we were disappointed. If there is any remaining inscription it is very well worn. Sue Mowat did try pouring water onto the stone in the hope of revealing any remaining trace of inscription, but nothing showed up. Our only hope is that the stone is still too dirty to reveal its secrets. So we shall just have to wait for the stone to dry, give it a really thorough brushing with Sue’s special, very worn nail brush and hope that something turns up. 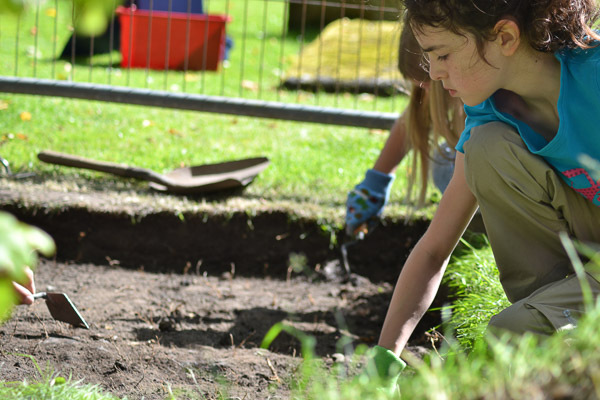 Regardless, the young archaeologists were very pleased with the results of their two hours of labour and are now looking forward to the next phase of the dig. 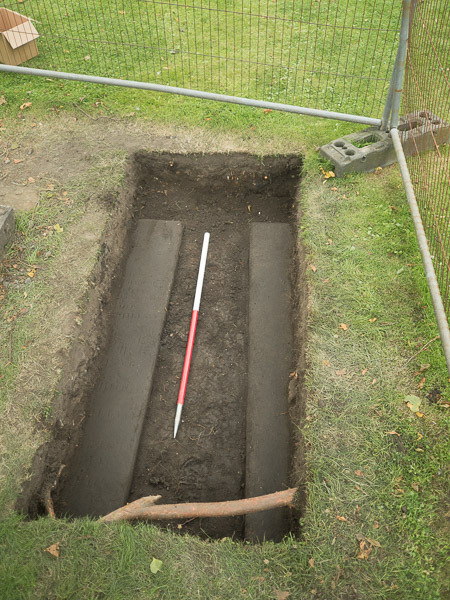 We intend to extend the trench very slightly to the west and south to fully reveal the edges of our stones. At the same time we will establish if there is another stone lying to the south and whether or not the headstone immediately to the south is partially buried. The feeling is that only the top of the stone is exposed and that the buried portion may carry an inscription for us to discover and read. 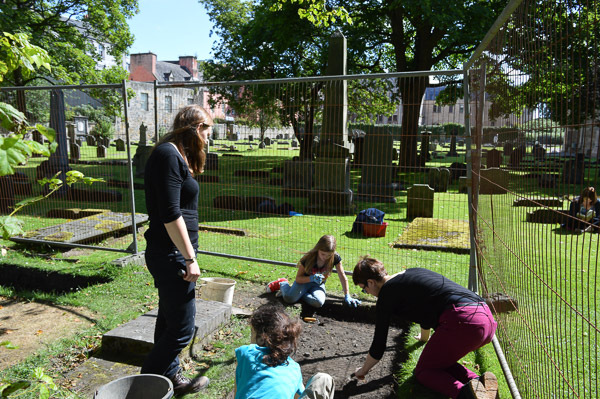 Today we had five young archaeologists working in the graveyard: Mhairi, Griffin, Erin, Algirdas and Lauren. Photos will hopefully come soon. We spent the morning carefully cleaning the north gravestone that was cleared yesterday. It was careful and meticulous work carried out with nail and tooth brushes and cocktail sticks. We couldn’t use metal tools incase we damaged any of the lettering. Rather than describe the stone and the brief stories it tells, I’ll let it speak for itself. Click on the image of the stone for a zoomable view. Once again grave-digger Darren helped out. 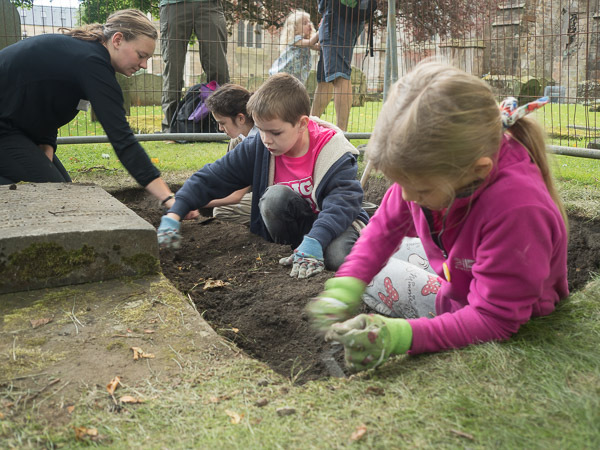 This time he instructed the young archaeologists in how to use a metal detector responsibly, working in part of the Abbey grounds soon to be turned into a carpark. We found a nail, some silver foil and a pen top! We’ve all been really impressed at how quickly Dunfermline YAC members have learned, how much fun they have been to work with, and the very real contribution they have already made to Dunfermline’s heritage. We will be taking a few days off from working in the graveyard, but will be back with more soon. Another productive day on site. Mhairi, Erin, Finlay were joined by (late) newcomer Alfie. Grave-digger Darren kindly removed the rest of the turf above our inscribed gravestone so that we could clear it. The intrepid team carried on through the rain to completely expose the stone and its inscription, as well as making some more nice finds. We found that our stone abuts the monument to the north, but is several cm lower, exposing soil beneath the northern stone. This looks rather odd. Our stone has several inscriptions dating from between 1796 and 1881. Hopefully we will have some nice photos of the inscriptions tomorrow. hard clearing up the south side of the trench. The all made interesting finds of what is most likely early 20th century rubbish. We will photograph some of the finds tomorrow and post them to the Web site. most of the stone disappears under the side of the trench, and like the one to the south, is also partly covered at the west end too. The three intrepid archaeologists did great work to clean the stone, but as far as we could see there is no inscription. It could easily be that an inscription still lies under the soil, but not all the stones found this year have inscriptions on their upward faces. A really busy couple of hours today. Our stalwart excavator Mhairi was joined again by Erin, Algirdas and Griffin. Today we were determined to find at least one gravestone. Here we see Mhairi and Erin doing a bit of speed troweling. This photo was taken just before their gloves began to smoke. Trowels were seen to glow a dim red colour. Algirdas found considerable amounts of treasure, mostly in the form of quartz, but also some nice pottery fragments. Here he is showing Naomi his latest find, which either ended up in the finds tray, or the bucket, depending on how impressed Naomi was. Naomi is not easily impressed. Here is Griffin, in a characteristically laid-back position. He continued working with surprising vigour, endurance and occasionally his feet. This was not encouraged! All the hard work eventually paid off. First Morven, one of our leaders, and Erin found the eastern end of a gravestone, closely followed by Erin who found the west end of the stone. stone. The rest disappears under the edge of the trench. 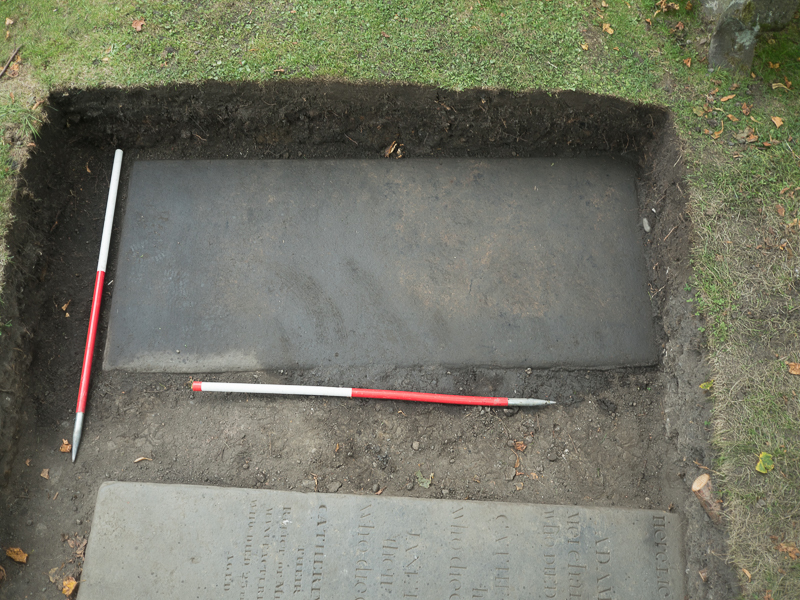 The trench will have to be extended north and a tiny bit to the east to reveal the rest of the stone. Most excitingly, as we cleaned we began to realise that the gravestone has a nice, clear engraving. 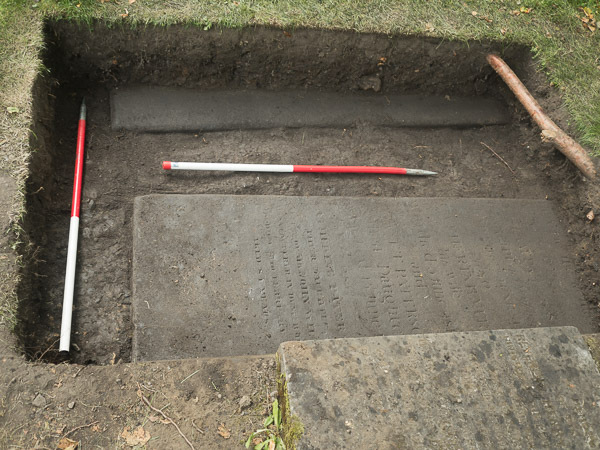 Sue Mowat of DHCP was on hand, and told us that the lettering is in a 19th century style, so this may be one of the younger stones uncovered this season. The sun shone on this day! Mhairi and Erin were joined by Scotland’s Urban Past (SUP) today. 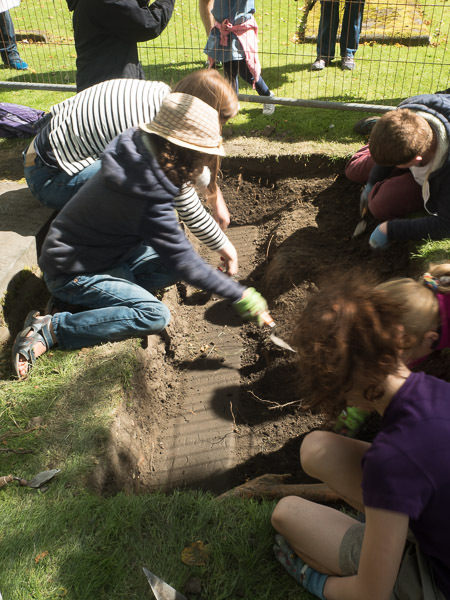 The team was in Abbot House, but came to join in the YAC dig and take photos and video of the dig in progress. 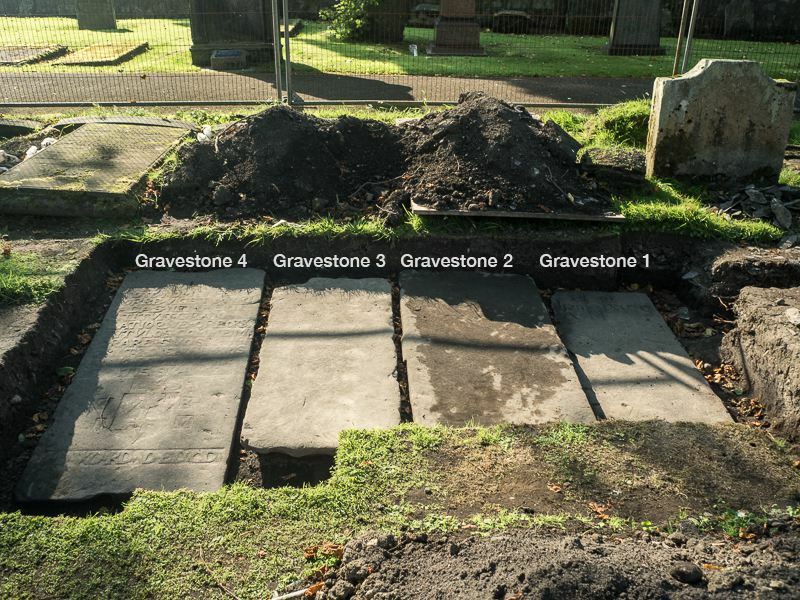 Danny of SUP also helped us to begin planning the gravestones exposed so far. We hope to do more planning next week. Erin and Mhairi were our volunteers today, with expert and very friendly guidance from Naomi, one of our leaders. They took off some more of the top soil and then used a probe to determine if there really is a gravestone somewhere beneath. The probe clinked convincingly along the northern and western edges of the trench, so these will be the focus for tomorrow. A good first day. Griffin, Algirdas and Mhairi made a great start digging our plot. Unfortunately I completely forgot to take any photographs of them at work, but we do have before and after pictures. 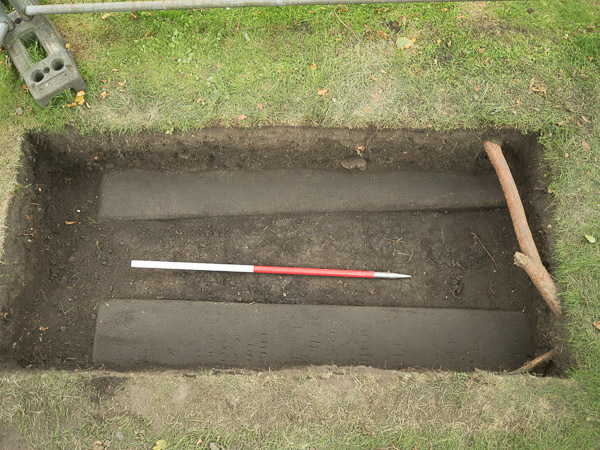 The first photograph shows the plot before digging commenced. You will just have to imaging young folk stood behind, trowels in hand, eager to get stuck in. the work was done by our YAC members. we have gone down about 6 to 8 cm and exposed a tree root in the righthand side of the trench. The soil is becoming increasingly filled with bits of sandstone, fragments of burnt coal, and broken pottery and glass. This represents infilling that took place in the 1930’s. The photograph of the find tray shows a representative sample of what was found. 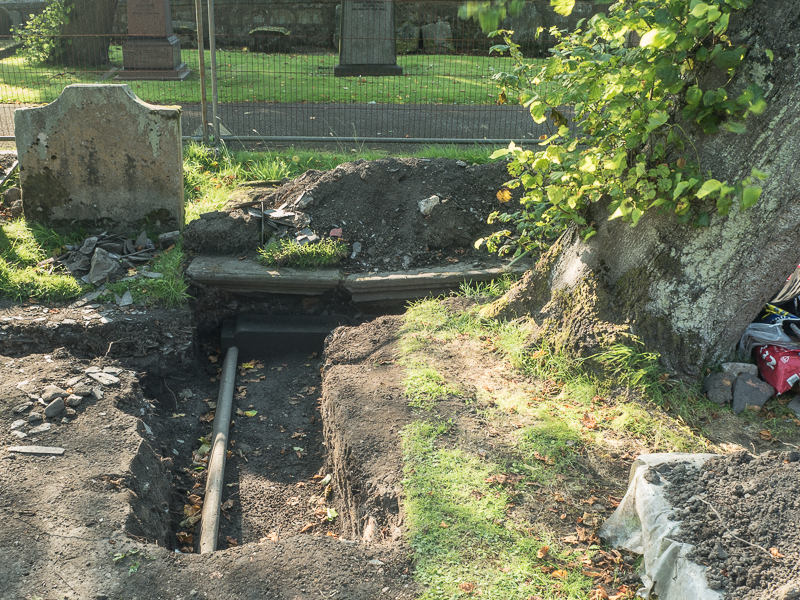 Tomorrow we hope to get a little deeper and then to probe the ground again to confirm that gravestones lie within the plot. Abbot House closes to the public on August 15th. 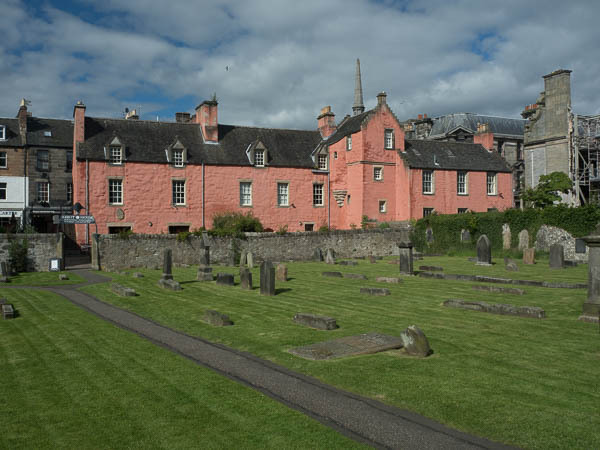 But in the meantime we are working hard with Scotland’s Urban Past (http://scotlandsurbanpast.org.uk) to record as much as we can of the building and the community of people who love it so well. Dunfermline YAC has the chance to get involved over the next two weeks with photography, film-making, drawing and planning. If you are aged between 8 and 16, would like to join YAC and get involved, then send an email to contact@yac-dunfermline.org.